The Taiwan-based manufacturer computer manufacturer has ambitious plans to capture 25 percent of the Russian market for tablet computers. The Taiwan-based computer manufacturer Acer is planning to capture 25 percent of the Russian market for tablet computers. In the first quarter of 2013 Samsung accounted for 25 percent of market share, Apple for 19 percent and Acer for only 3 percent according to data compiled by the Russian retailer Euroset. 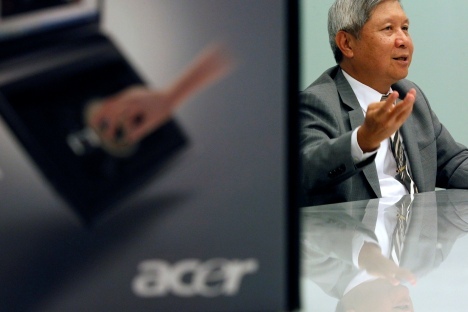 Acer’s president, Jim Wong, told Kommersant that this year the company plans to substantially increase its sales of tablets in Russia. “We want to double our total sales in the second half of the year in comparison with the first half of 2013, and we’d like to see our market share in Russia at more than 25 percent,” said Mr. Wong. Though this year will see no change in strategy in Russia, on a global level, Acer is planning new advertising partnerships, including some with fashion brands. “It’s an achievable objective, and we’re working on it. We’ll start to ship new models in the near future,” says Denis Kutnikov, general director of Acer’s Russian office. These include Acer’s Android tablets, the 17.9-inch Iconia A ($255) and a new version of the 7-inch Iconia B1 ($185). In addition, Acer is launching an 8-inch tablet running on Windows 8 on June 4. According to GfK, 7,500 tablets running on Windows RT and Windows 8 were sold in Russia in March, and Acer’s share in this segment was 35 percent. The second group of tablets – webbooks running on Android and iOS – has the biggest sales, with 424,500 devices sold in March. Acer’s share in this segment was 3 percent. In 2011, Acer took up 11 percent of the Russian market for tablets, but in some months in 2012 this figure was down to 10 percent, Denis Kutnikov recalls. Last year, when 3.15 million tablets were sold in Russia, Acer’s share was 5.3 percent. The head of Acer’s Russian office estimates that this year between 6 and 6.5 million tablets will be sold, of which 100,000–120,000 will be devices running on Windows. Judging by their current performance, it is unrealistic to think that they’ll be able to account for more than 25 percent of sales in the tablet market this year, says Kommersant’s source in the major electronics manufacturer. In the first quarter of 2013 Acer was not in the top five manufacturers of tablets in the world. In Russia its business is far more successful: various estimates put Acer in fourth place after Samsung, Apple and ASUS, says Anton Spiridonov, editor-in-chief of Hi-Tech.Mail.Ru. “But Acer’s share so far is less than 8 percent, and there is no sign of a trend toward major growth: the product range is small. It’s possible that the company is banking on the super-budget Iconia B1, and the Iconia A1 that has just been announced, but it would be unrealistic to think of taking 25 percent of the market even on the basis of its figures for the whole year and with the most aggressive marketing campaign. It would be a miracle if Acer could overtake ASUS and achieve even a two-digit figure by the end of the year,” says Anton Spiridonov.